Naku naku kahit wag ka ng mag tour. Waley na waley ka na sa totoo lang. as if your comment matters 😂😂😂😂 sorry pero hindi ikaw Ang deciding factor hahah. madami pa din talga silang biebers. Excuse me. He is justin bieber! And mark my word, he is still a big hit pag ng comeback sya. He is sexier and more mature now. Good thing he is married na so may someone who will calm him. 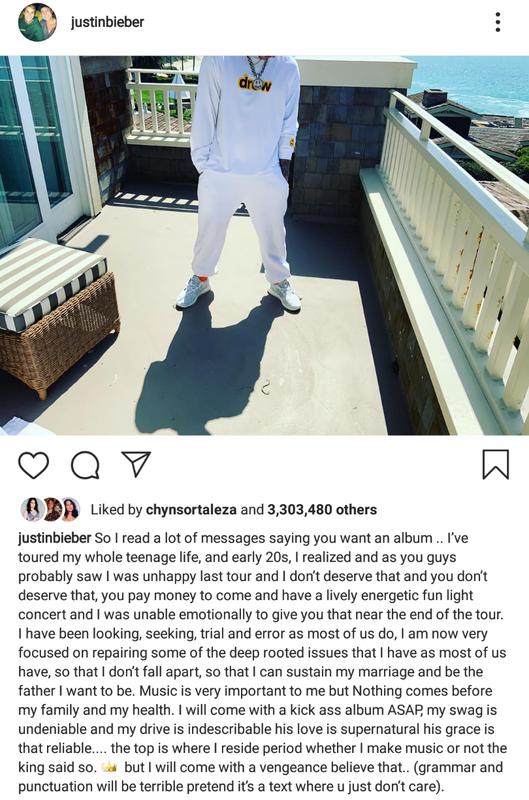 I cant wait for your comeback justin! Bleh. Anong personal issues niya? Akala ko ba happily married to? Sana mahigitan mo yung last comeback mo kun hindi bye bye ka na talaga. Marami pa rin syang Beliebers kaya carry lang. That will be a hit. Nag quit kc overworked and it was ruining his relationship with God, family and real friends. Di pa naman sya has been. Sobrang bumenta last album nya. Dominate nya lahat ng charts. Wag kayong echos jan. I used to be such a fan but I stopped during those times he started being so rude to fans and the media and he kept lashing out. There are just so many other artists deserving to stan and I’ve moved on. But I still feel bad for him and I hope he gets through this a better person. Well, kung mula pagka bata niya andami nang nambbash sa kanya, hanggang sa lumaki na siya, mababaliw ka naman talaga. There's only so much one could take, i guess. You are blind then.Those two are fake. 1:37 sino ka para sabihin na fake sila? Di ka lang maka move on kasi di si Selena yung pinakasalan nya. Jelena fans palaging sinasabi na fake si Justin and Hailey lol. Move on girl! Magaling ang team nyan nila Justin, Arianna, etc. Laging catchy mga songs kaya laging mabenta. Si taylor ang medj nawawaley actually. Taylor ? Hinde din. Naka world tour siya ngayon all sold out tita! 1255 Yas and the Swifties are all discussing na on the theories for when the next album will drop. It was just her birthday and her magazine feature trended pa. Taylor is still super big! Mas Patok ngaun si Ariana Grande eh kesa kay taylor. Wla kseng hit single si T eh. We will wait for you Justin. I thought marriage life will give him happiness. What happen? Ako kahit 50 na belieber din ako.Go Justin me and my son is always a fan. Kung makacomment naman ang iba dito. He was a teen nung sumikat siya. Probably gusto niya nung una but then napagod na siya. For sure may effect un sa growth niya as a person. Okay lang yan. Justin Bieber is Justin Bieber. tama justin, take some time off to get your sanity back. britney took some time off too to shy away from the craziness of the industry, and look at her now, i've watched her a few years back on her comeback residency in vegas and she looked so much healthier.